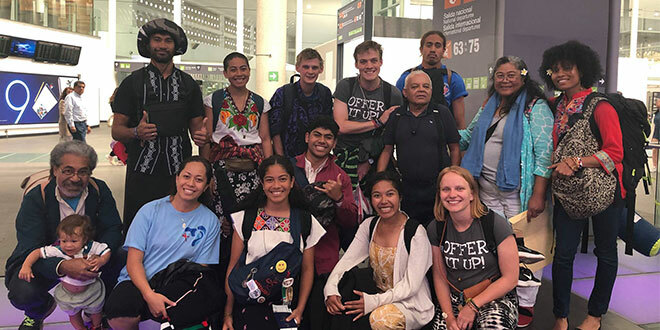 Pilgrimage: Catherine Santos (front second from right) with her fellow World Youth Day 2019 pilgrims. MY first experience of World Youth Day was in Krakow a couple years ago. I was amazed by the large crowd of young people who gathered from all over the world to celebrate and grow deeper in their faith. My pilgrimage group did the Stations of the Cross walk in Fatima. There, I heard Jesus calling me to be like Veronica; wiping his beaten and bleeding face by serving “the least of my brothers and sisters” (Matthew 25:40). This encounter prompted me to question my vocation – something I was putting off for about a year. I returned and spent the rest of the year opening my heart to the possibility of being called to religious life. However, as the seasons changed so did I in my spiritual journey. Despite my efforts, I still had no definite answer to my vocation so I came to Panama wanting to get clarity and direction, but finding the answer to my prayer proved to be more difficult than I expected. I found the experience challenging as I had developed an appreciation for silence and contemplative prayer, which clashed with the loud crowd that swarmed Panama. Instead, I sought opportunities to have deep faith-filled conversations with people around me to escape from the noise. I found it fascinating how God was moving in people’s lives and searched for a pattern in how he might speak to me. WYD week finished and, still, nothing. Among the crowd of half a million people, am I really the only one who cannot hear him? In this brief moment of desolation, I recall the life of St Teresa of Kolkata who said “I believe God loves the world through us – through you and me”. This brought to mind those moments when I received love from my pilgrim group when I was feeling sick, and the way in which they tried to comfort me by building a fortress around me as we walked through large crowds. God had been speaking to me all along through other people. Reflecting on the conversations I had with people, I became aware of the interior movements in my heart as they spoke about their vocation – the highs and lows, the way that God has blessed them with special graces to overcome life’s hurdles. They reminded me of God’s faithfulness and how we should be reciprocating it – after all, that’s what faith is; to believe even when we cannot touch, feel, see or hear. I had the opportunity to return the love I received when we did a mission day with the Missionaries of Charity in Mexico City, where nine sisters and a handful of volunteers spend their days caring for the poor, forgotten and unwanted. I was expecting to care for orphaned children for a couple hours, but instead met with disabled children and women, most of whom suffered with cerebral palsy. We spent the entire day playing, entertaining and feeding them. Although there was a language barrier, joy exuberated through each person as we sang songs that praised God for his goodness. My WYD experience isn’t what I had expected, but it was better than what I could have imagined for myself. I’ve learnt it’s important to be present in the moment – don’t worry about tomorrow, for tomorrow will worry about itself (Matthew 6:34). St Teresa saw herself as a “little pencil in the hand of a writing God who is sending a love letter to the world”, if that’s what she told herself each day to accomplish and be all that she was, then that’s a good enough answer for me. Catherine Santos is the marketing officer of The Catholic Leader.